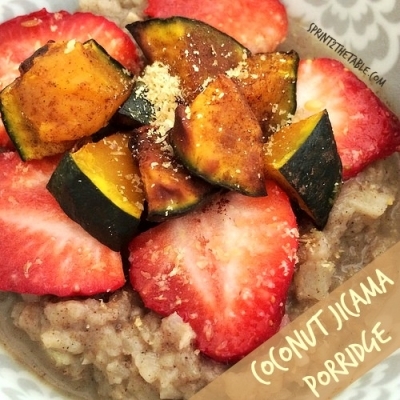 Jicama can do anything - including oat-less oatmeal. I really liked the additional creaminess the protein powder adds, making it even more oatmeal-like. Peel jicama and chop into chunks. Place jicama in a food processor or blender and pulse until a rice-like crumble forms. Place all ingredients in the porridge â€œbaseâ€ in a pan over medium high heat. Cook until mixture starts to bubble. If using protein, add it here. Continue to cook until most of the liquid is absorbed and mixture becomes creamy (~5 mins). Taste and adjust spices or add sweetener as desired (I didnâ€™t need any). Transfer to bowl and enjoy!